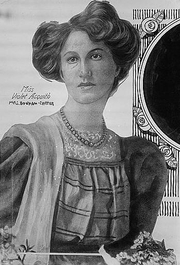 Helen Violet Bonham Carter, Baroness Asquith of Yarnbury (1887–1969); British politician born Violet Asquith as the daughter of Liberal Prime Minister H. H. Asquith. Created Baroness Asquith of Yarnbury in 1964. She grew up in a heavily political environment, living at Downing Street at the time her father was PM and socializing with key political figures of the day -- she was especially close to Winston Churchill. In 1915, she married her father's private secretary Sir Maurice Bonham Carter and was a grandmother of actress Helena Bonham Carter. Violet Bonham Carter is currently considered a "single author." If one or more works are by a distinct, homonymous authors, go ahead and split the author. Violet Bonham Carter is composed of 5 names. You can examine and separate out names.